The Lake Shore Rail Maps website made its humble debut on August 1, 2010, and has since undergone many revisions, updates, and expansions. It is a perpetual work in progress that grows and changes as new material and information is discovered, collected, and incorporated, to paint a more vivid and detailed picture of the interurban era in northern Ohio. 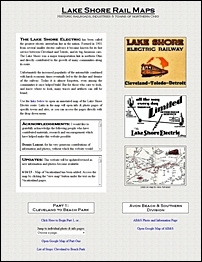 Although various books cover the corporate and operational details of the Lake Shore Electric Railway or the history of individual towns, the Lake Shore Rail Maps website strives to interpret the history of the railway through the lens of local history. What did the railway mean to each town? What exact route did it follow through the towns? What bits of local signifcance did the railway witness or influence through the years? And what artifacts and remains of the railway can still be found today? 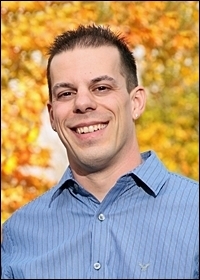 Drew Penfield was born in Amherst, Ohio in 1977, and became interested in local history in grade school. It was a fitting pursuit, considering that the Penfield family has been in Lorain County since 1820, when Peter Penfield arrived from New York state and established Penfield Township. Drew's great-grandfather was a conductor for the Lorain Street Railway in the early 1900's, and later worked in the electrical department at US Steel. His grandfather installed radio-telephones on lake freighters for Lorain County Radio Corporation and was later involved in the growth of Lorain Products Corporation. Drew relocated to Austin, Texas in 2003. Absence often makes the heart grow fonder, and his interest in the history of northern Ohio was rekindled by information that began surfacing on the internet and newly published books. He made contact with local history buffs and historians and considered what kind of contribution he could make himself. This was the seed that became the original Lake Shore Rail Maps website. Today, Drew lives near Dallas, Texas, and continues his Ohio history research on the internet, through various contacts, and during annual visits to family and friends in Ohio. His other interests include cycling, swimming, triathlons, reptile keeping, and classic cars.